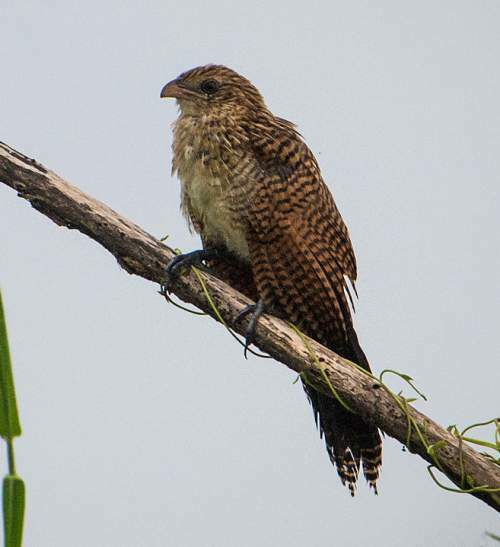 The lesser coucal (Centropus bengalensis) belongs to the family of cuckoos and coucals, the Cuculidae. The lesser coucal species is distributed in India, Nepal, Bhutan, Bangladesh and southeast Asia. Unlike other cuckoos, these coucal species are not brood-parasites. These coucals are polytypic species. The lesser coucal (Centropus bengalensis) is a comparatively small coucal, measuring 30 to 40 cm in length and weighing 90 to 150 gram. There is size variation among the subspecies. The overall plumage of the lesser coucal is black and the wings are rufous. In breeding plumage, the head and the upper back becomes glossy black with dark shafts to the feathers. In non-breeding plumage, the feather shafts on the head and back become whitish.The tail is long. The central tail coverts are long and barred. The juveniles have pale brown feathers with barring. The bill of lesser coucal is short, down-curved and yellowish. The irises are dark brown. The feet are blackish and the hind claw is long. Their call is a series of low "whoot..woot" sound. The lesser coucal species is distributed in India, Nepal, Bhutan, Bangladesh, Myanmar, Thailand, Cambodia, Laos, Vietnam, China, Taiwan, Malaysia, Singapore, Brunei, Indonesia, Philippines and Timor-Leste. In India, these lesser coucals are distributed in the states of Karnataka, Kerala, Tamil Nadu, Odisha, West Bengal, Bihar, Uttar Pradesh, Uttarakhand, Sikkim, Assam, Meghalaya, Arunachal Pradesh, Nagaland, Manipur, Tripura and Mizoram. The lesser coucal nominate subspecies C. b. bengalensis is distributed in India, Nepal, Bhutan, Bangladesh, Myanmar, Thailand, Cambodia, Laos and Vietnam. The subspecies C. b. medius is distributed in Maluku Islands (Indonesia). The coucal subspecies C. b. lignator is distributed in south and southeast China, Hainan (China) and Taiwan. The subspecies C. b. javanensis is distributed in Malaysia, Singapore, Brunei, Indonesia and and southwest Philippines. The lesser coucal subspecies C. b. philippinensis is distributed in Philippines. The subspecies C. b. sarasinorum is distributed in the Talaud Islands, Sangihe Islands, Sulawesi Islands and the Lesser Sunda Islands of Indonesia. 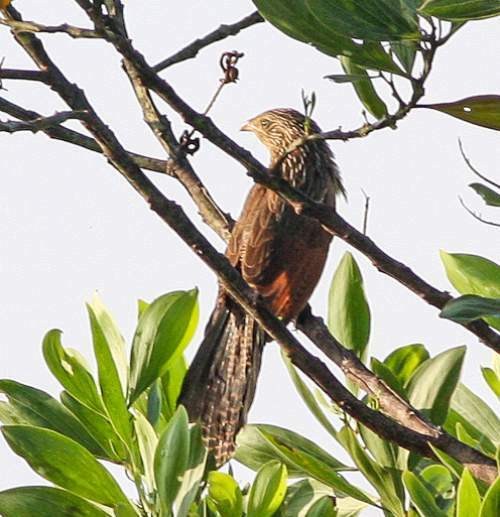 These lesser coucal species do not normally occur in forests. They normally occur in altitudes from 0 to 1800 meters. The artificial ecosystems and habitats of these species include tropical and subtropical heavily degraded forests and cultivated lands. The natural ecosystems and habitats of these species include, open country, tropical and subtropical moist shrublands, marshlands, mangroves, swamps, peatlands and bamboo thickets. The diet of the lesser coucal consists mainly of insects. Caterpillars and other insect larvae, grasshoppers, cicadas, crickets, locust, spiders and lizards are their primary food. They glean the insects from the foliage and branches as well as hawk them in the air. The breeding season of these lesser coucal species is during May to September in India. The laying season is from December to July in Malaysia. The nesting sites of these species are located in low trees and shrubs. The nest is a dome of grass blades and twigs. These coucal species are monogamous. Both parents take part in incubation and care of young. The clutch usually contains two to four eggs. These lesser coucal species are non-migrant resident birds. The birds in the higher altitudes descent to lower levels during winter. The global population size of the lesser coucal (Centropus bengalensis) has not been quantified. The overall population trend of the species is considered to be increasing. 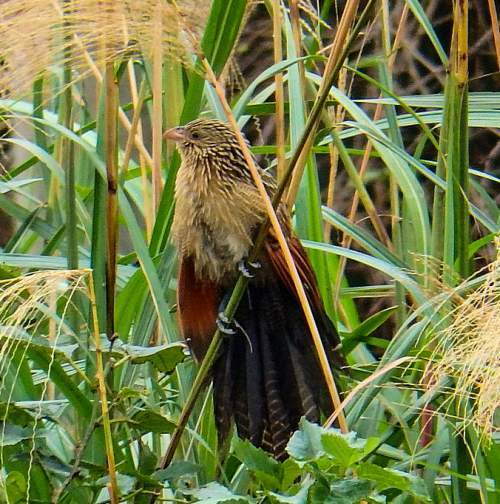 In most of its range, this coucal species is reported to be common and locally abundant. The generation length is 3.8 years. Its distribution size is about 21,100,000 sq.km. Habitat alteration and destruction, hunting and trapping for pet-trade are the main threats that are endangering the survival of this species. The lesser coucal (Centropus bengalensis) does not approach the thresholds for being Vulnerable either under the range size criterion, or under the population trend criterion or under the population size criterion. The CITES (Convention on International Trade in Endangered Species of Wild Fauna and Flora) status is ‘Not Evaluated’ for lesser coucal (Centropus bengalensis). The lesser coucal (Centropus bengalensis) is closely related to the black coucal (Centropus grillii) and the Philippine coucal (Centropus viridis). The six recognized subspecies of the lesser coucal are: C. b. bengalensis (J. F. Gmelin, 1788), C. b. medius Bonaparte, 1850, C. b. lignator Swinhoe, 1861, C. b. sarasinorum Stresemann, 1912, C. b. javanensis Dumont de Sainte Croix, 1818 and C. b. philippinensis Mees, 1971. Current topic in Birds of India: Lesser coucal - Centropus bengalensis.